Screencast-O-Matic is an easy screen recording and video editing software giving anyone, anywhere the ability to create amazing videos. As a Deluxe user, you can add images, text, animations and more to all of your videos! 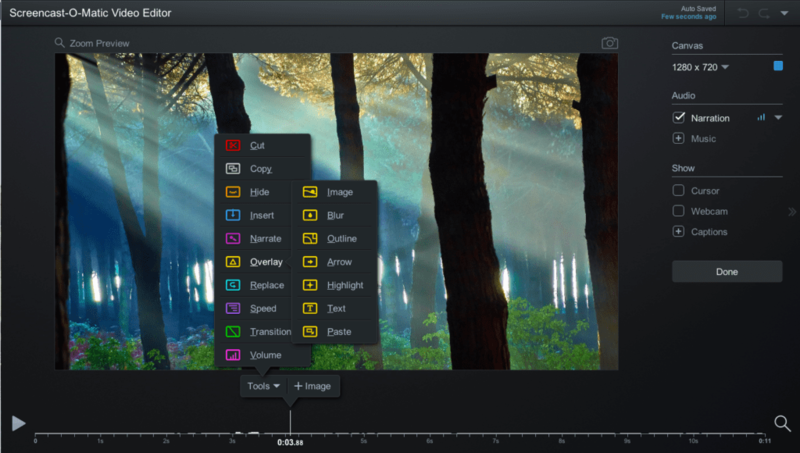 We’ve put together the ‘Screencast-O-Matic Video Editor Cheat Sheet’ to help users understand all the editing tools and features to enhance their video experience. The toolset is located above your video editing timeline. The editing process is simple and intuitive. It’s the same process for almost every tool you use. Head to the location on your timeline where you want the tool to appear. Click on ‘Tools’ in the menu bar. Choose the tool you would like to use. When directed, drag the timeline bar to its desired length. Note: You won’t have to do this for every tool. Click ‘Ok’ when you are ready to commit the edit. Once you place the tool into your timeline, an icon will appear in your menu bar indicating that it’s been placed in that location. You can always click on the icon to re-edit or remove the tool. Below is a list of available tools and features on the Screencast Video Editor. Each tool includes a short description of what you can do with it. All you need to do is follow the simple process above to implement them into your video clip. Cut – Delete or cut portions of your video content. Copy – Tool allows you to copy selected portions of your video. You can paste the copied portion anywhere on your timeline or choose another video. Hide – You can choose to hide either your cursor or webcam on selected areas of your video. Insert – There are several options to insert videos or recordings into your timeline. New Recording – The recorder will open, and you can add a new recording to your timeline. Existing Recording – You can select an existing recording in your recordings manager to insert into your video. Pause – Inserts a pause into your video. You can select the amount of time you want the pause to last in your timeline. Video File – You can select a video mp4 file to insert into your timeline. Paste Recording – Inserts the ‘copy’ (see Copy) into a selected location on your timeline. Narrate – Select a portion of your timeline to narrate over. The narration tool will open, and you can add your audio voiceover by hitting the record button. 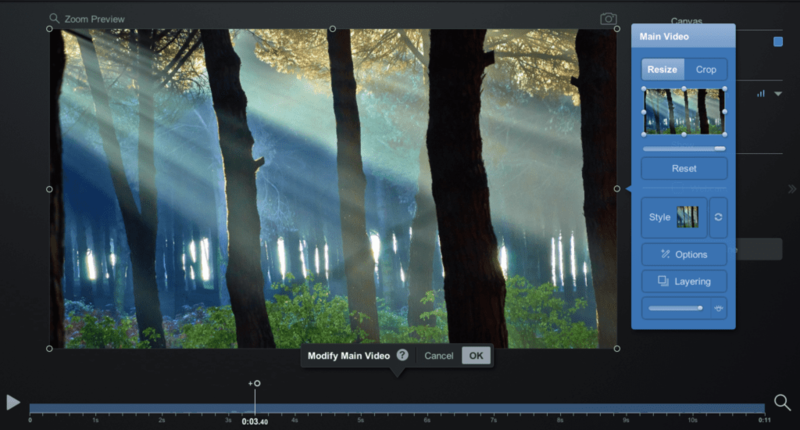 Overlay – Add special effects, text, blurs to your videos or recordings. Image – Add an image to your video timeline. You can add a border and shadow around images as well as control the opacity. Blur – Blur a section of your video. You can drag the opacity and choose how blurry you want your section to be. Outline – Add an outline or shape to your video. You can choose ‘box’ or ‘oval.’ There are color, thickness and shadow options for shapes and outlines. Arrow – You can add an arrow to sections of your video. Color, thickness and shadow options are available. Text – You can add text anywhere on your video. You can choose the color and font of the text. You can also add a background color with options for shape, color, opacity, shadow, and pointer. Paste – You can duplicate or copy another overlay and paste it anywhere on your timeline. Replace – There are two options in ‘Replace’ you can utilize for your video. Replace Video – This option allows you to replace a portion of your video with a new recording. It will replace the existing ‘Main Video.’ You can choose to freeze audio so that it won’t move in your timeline. Freeze Video – This freezes a frame so you can extend it by dragging the bar on your timeline. You can choose to use the frame at the start or end of your timeline bar. You can also choose to freeze the cursor. Speed – Speed allows you to change the speed of your video. You can choose to ‘Speed Up’ or Speed Down’ and select the desired rate of speed. Transition – You can add a transition anywhere on your video. There are dozens of transitions to choose from. There are some transitions where it allows you to choose the direction of movement. Volume – Control your volume levels in sections of your video by clicking on ‘Volume.’ Just click on your audio source and click on the arrows to their desired volume, or you may choose no volume. Main Video – By clicking on the ‘Main Video’ (the screen of your video) you have multiple options to personalize your video. Resize or crop – You can resize or crop the main video on your timeline. If you need to get rid of black sides, just click on resize and drag your video out to hide the sides. Style – This allows you to choose the shape of your video (square, oval or rounded). You can also add a shadow around your video. Options – Flip cam and green screen features. Click here for more information on the features. Flip Horizontal – You can choose to flip the scene of your video by checking this option. Remove Color – This allows you to use the ‘Green Screen’ feature where you can remove the color of a background. You can choose which color to remove (green is recommended) as well as the tolerance of the removal. Layering – There will be times when you have many layers of overlays or video on your timeline. This option allows you to arrange the layers in the order you want. Just drag the box to reorder. Opacity – The eye icon indicates the opacity of your Main Video. You can choose the opacity by dragging the bar left or right. Controls on the right-hand side of the Video Editor. Canvas – This option controls the size of your video. You can choose from preset sizes, or you can customize the size by typing it in. You can also select the background color of your video. Audio – Depending on your audio sources, you may see the following options on your video editor. Narration – Audio narration. You can control the volume throughout your video by clicking on the bars. You can check off ‘Normalize’ and ‘Reduce Noise’ to get clearer audio. By clicking on the arrow button, you can import or export the audio file. Computer Audio – Audio picked up by your computer device. You can control and manage the volume of your computer audio by clicking on the bars. Music – Add stock music or import your own mp3 audio file. Music allows you to show off your creativity. You can choose to add stock music tracks or import your own by clicking on the ‘Import Music’ option. Show – These options allow you to show or hide either your cursor, webcam or captions on your video. By checking off these options, you are choosing to show either your cursor or webcam throughout your video. Captions – There are several options to add captions to your videos. You can choose to add captions with a .txt file, use the easy speech-to-text tool, or type in your own captions. Click here for more about captions. 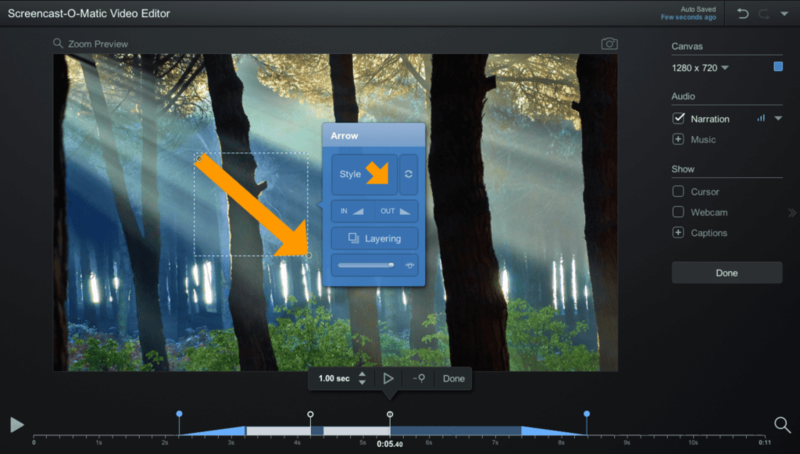 Edit Points – You can place edit points to animate or move objects in your video. Edit Points can be used for most of the tools located in ‘overlay.’ A full tutorial can be found here. We hope that this cheat sheet will help you utilize the best of what Screencast-O-Matic has to offer in the video editor. You can print it out or refer back to it when you are editing. There are many more articles on editing tips, how to best utilize the video editor and more! To upgrade to a Deluxe plan and get the best out of editing, turn to our plans page for more information.